I was more worried about falling on that vertical wall than the police catching me, but both were real concerns. And then I caused an avalanche. 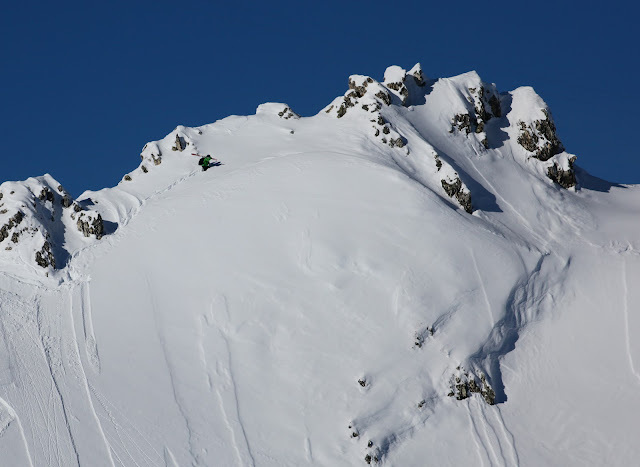 This is a story about my four day trip to Les Arcs, France. 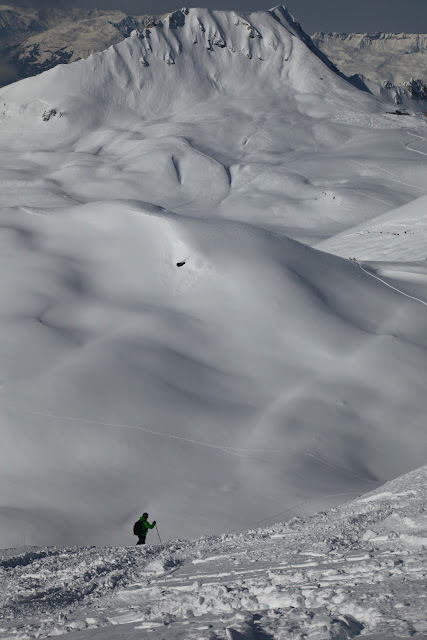 With my friend Jarmo on the trip, I knew that our days would be packed full of the most difficult skiing we could find. We ended up climbing a mountain or two every day and skipping lunches because we were too busy skiing. Just the exercise I needed! I am an outlaw. In violation of French laws and local regulations. I have not taken the national park educational course that teaches how to avoid disturbing the local fauna. 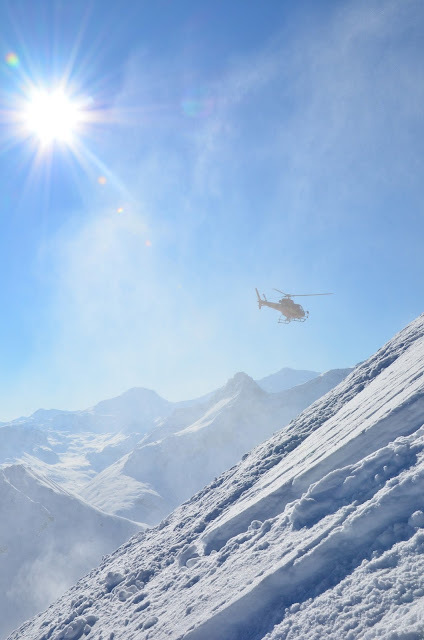 The ski patrol or the even the local police could come at any moment and throw me into jail. And apparently they are very eager to do so, because it gives them an excuse to go skiing some good powder while catching such a big criminal. Even if I know how to behave in the delicate environment. But the police are not my main worry at this point. I'm worried about the entrance to the east face of Aiguille Rouge. The rest of the slope looks skiable, but the entrance is... tricky. The entrance is an almost vertical wall, requiring side-stepping for about ten meters before the the slope levels to a more reasonable gradient. And the entrance is narrow. I am glad I have my new, shorter skis with me. We are somewhere between the Les Grandes Pentes off-piste and the Le Couloir du Génépy (the one closed by ministerial decree since 1991). Our local friend drops in first, making everything look easy. Then again, he spends most of his time on these slopes when he is not flying helicopters to off-shore platforms. Maybe he is more used to this than we are. 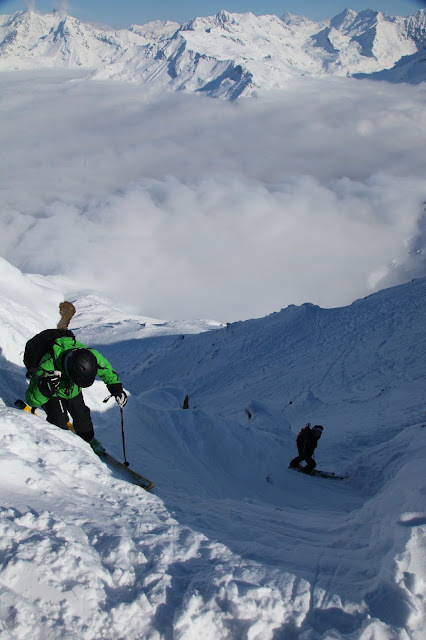 We follow and eventually make it to the slope without falling, and with only mild shaking. I'm not taking anything out of my pants to pee at this spot. Dropping on to the east side of Aiguille Rouge leads us to the open bowls of of the Reserve Naturelle des Hauts de Villaroger. There are plenty of route variations, but they all take the fall line in the beginning and later veer to the left, eventually making it to the small village, Villaroger. 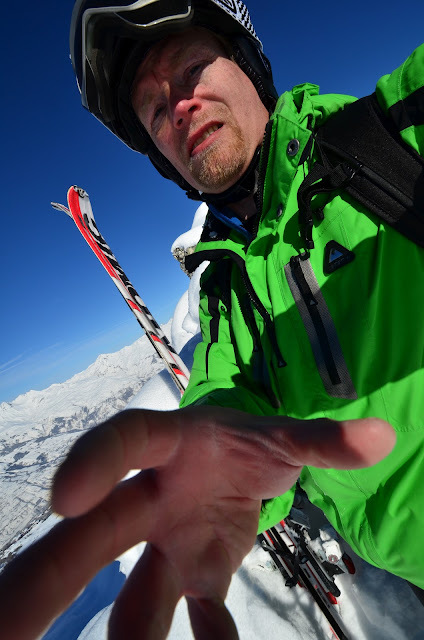 A few hundred meters of walking or pushing is needed before reaching Villaroger. But the payoff is huge. The vertical difference from the top of Aiguille Rouge (elev. 3226m) to Villaroger (elev. 1200m) is a whopping two kilometers. 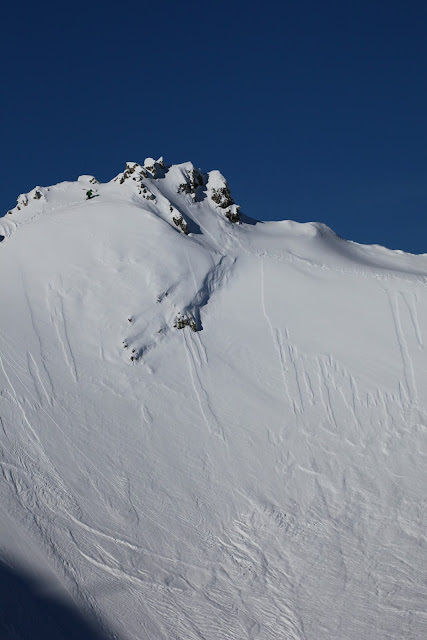 Depending on the chosen entry point into the off-piste routes, this means 1800 to 1900 meters of vertical on the out of bounds part. On one run. 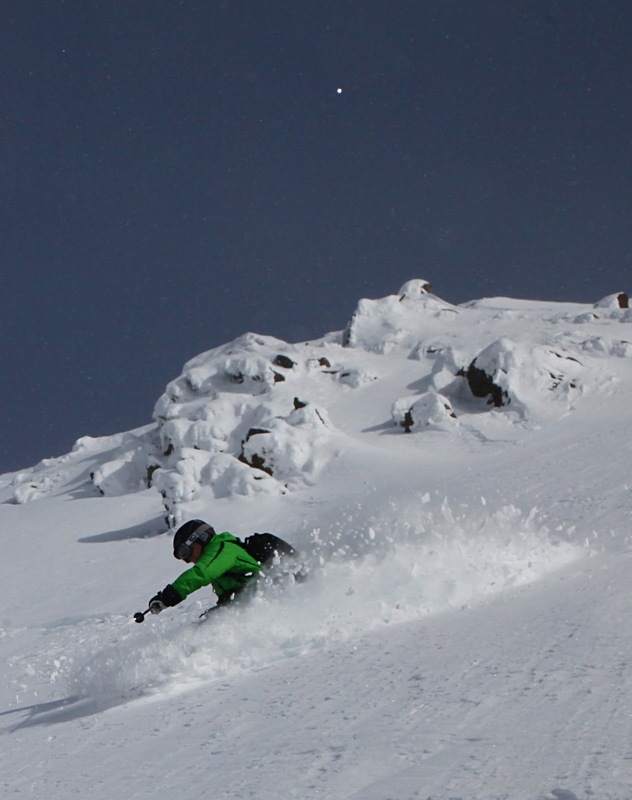 Given the large space, route variations, and the location far away from the ski area, there is usually plenty of untracked snow to ski. Towards the end of the route, all paths join and become a bumpy, icy, tiresome ski run. 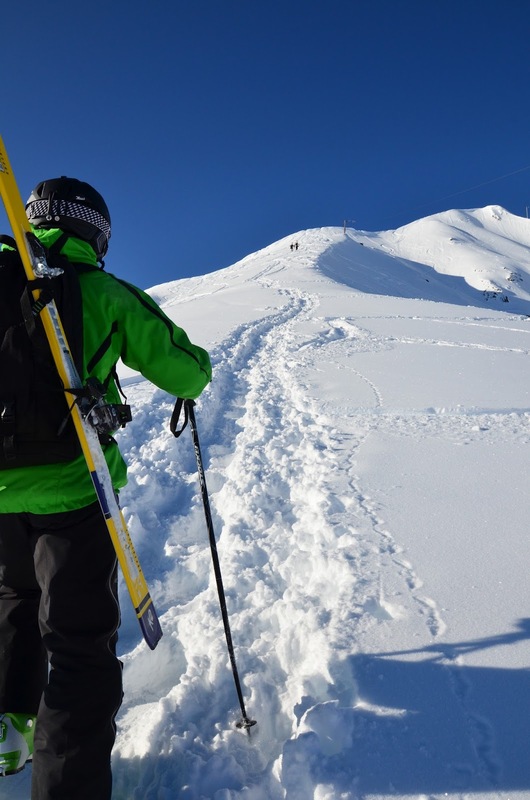 Return to the main ski area by taking three long, slow, and very cold chair lifts (Replat, Plan des Violettes, and Droset) from Villaroger. But the upper parts of the mountain are well worth the pain. 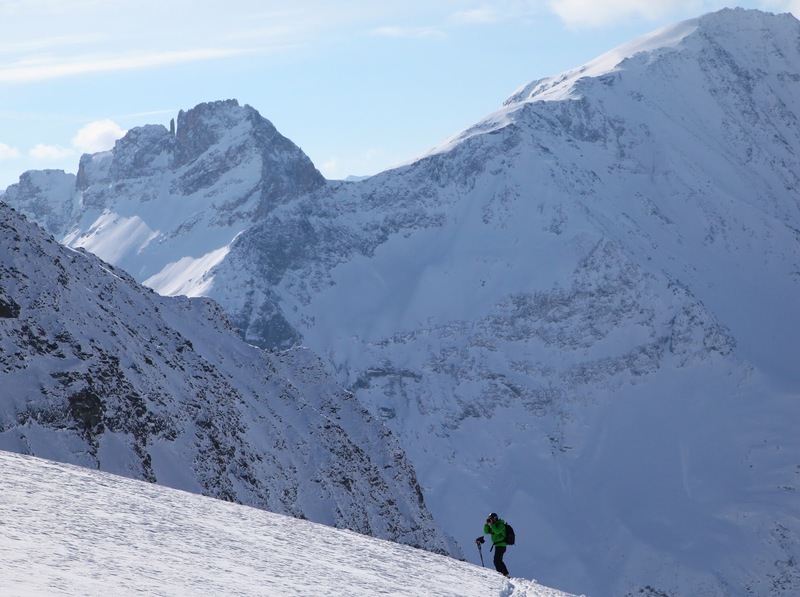 These off-piste runs are also exceptional in the sense that not much hiking is required to get to them. The Aiguille Rouge ski lift takes you to these areas, as long as you know how to switch to the other side of the ridge. Wrong route selection can lead to a bad day. 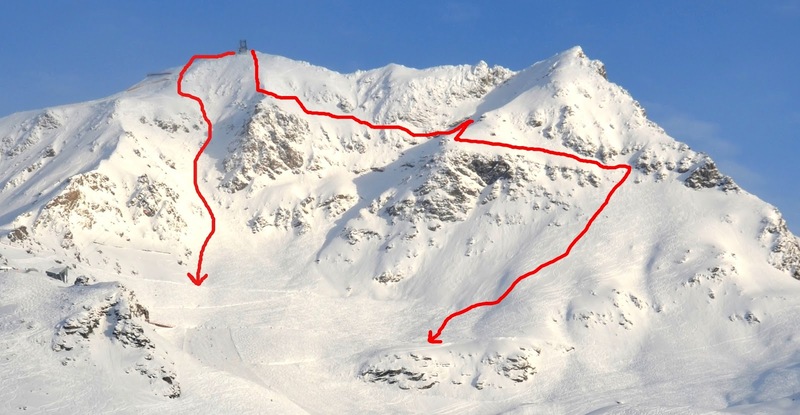 One route that I wanted to do but did not have time (or guts) is the Couloir en S. This is the most famous of the ski runs off the Aiguille Rouge. 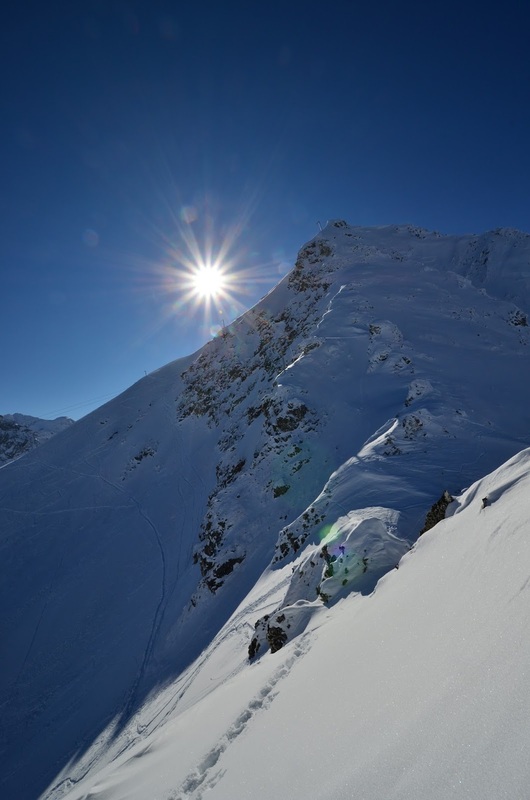 It is also 1900 meters high, but starts with a healthy 45 degree couloir for the first few hundred meters, with a need to switch between couloirs in the middle. It would have been interesting. Maybe next time. Another entrance to this same area took us from the top of the Grand Col lift to the col, an easy climb of 100 meters. Climbing a little bit higher we can take a steeper run to the right of the col. From here we enter the Itinéraire du Grand Col, a route that takes us further into the natural reserve than what can be reached from the top of Aiguille Rouge. There is a small hut at the top of the col, as well as a possibility to stop at the Refuge de Turia. As with all the backside routes from Aiguille Rouge, route finding is difficult. You are far into the wilderness area, there are rivers to cross and forbidden areas of the natural park to avoid, and there are obviously also mountain dangers. A guide is necessary. 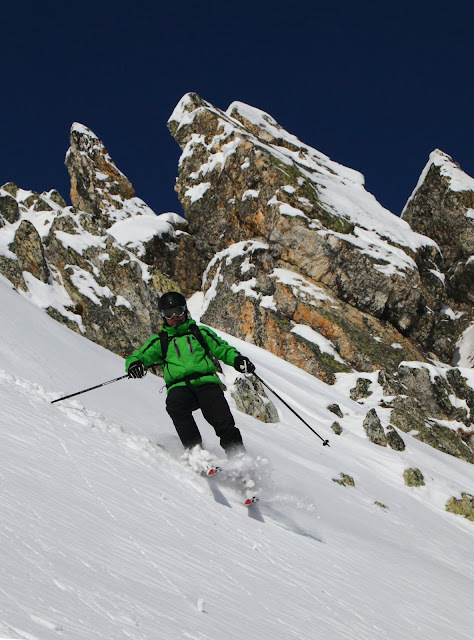 But the east side is not the only place on Aiguille Rouge for off-piste. The front of the mountain also offers interesting options. The most obvious route, the "Les Câbles", is straight down under the ski lift. We did not try this route, but it seems steep and interesting, though also quite quickly tracked out. The route is shown on the left on the picture below. The route that we did try started straight down under the lift as well. After a few hundred meters we took a long traverse to the left, crossing three ridges and the Arandeliéres bowl in the middle. The route is shown on the right in the picture. The traverse is airy; the slopes underneath are rocky and steep. 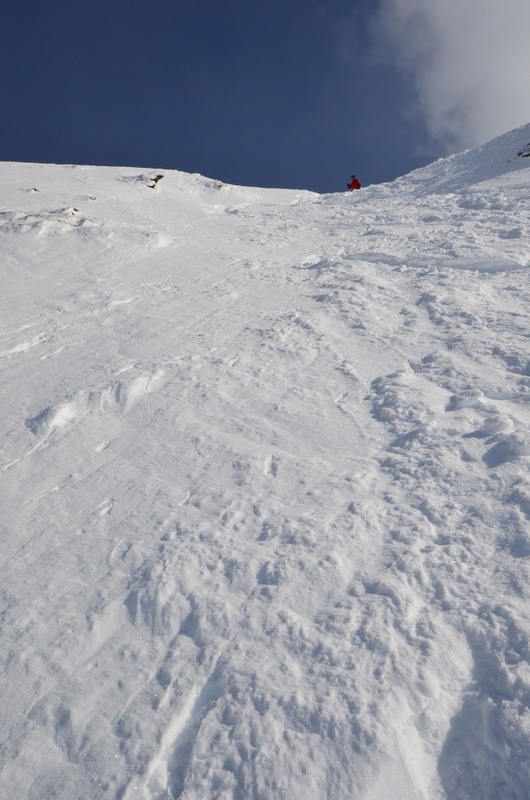 But at the end of the traverse there is a wide area that usually has plenty of untracked snow. 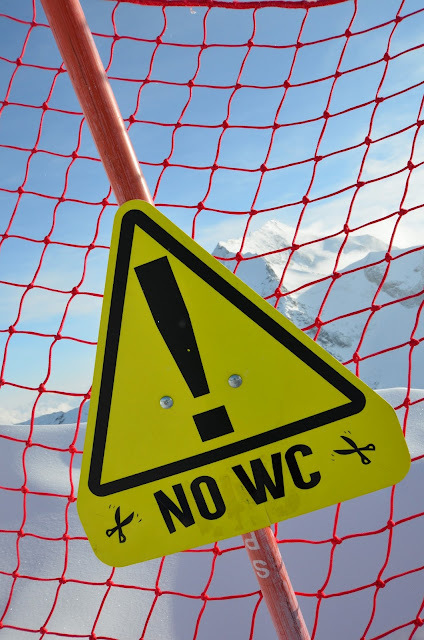 Definitely worth skiing, close enough to the lifts for added safety. 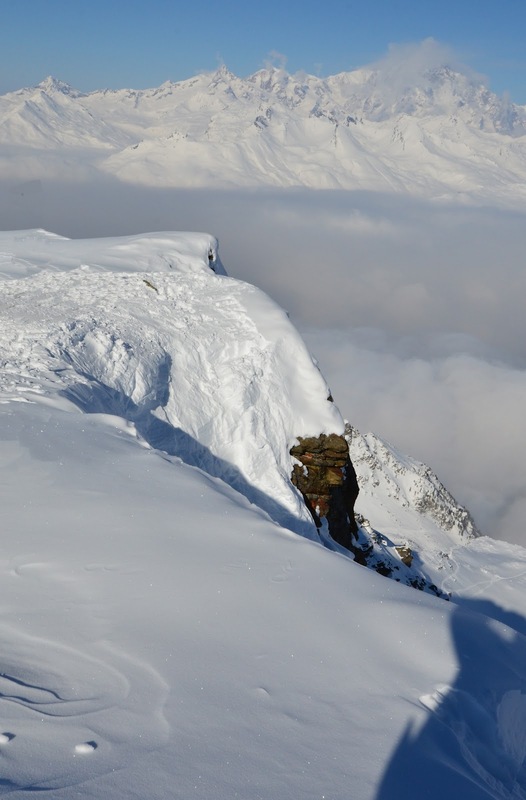 Avalanches and falls are a danger in this area, but it does not require quite the same self-sufficient expedition setup like the other side. Avalanche danger was only moderate or small when we were visiting Les Arcs, and having checked with the ski patrol this route was OK except for some rocks. Those rocks did some damage to my already suffering skis, however. 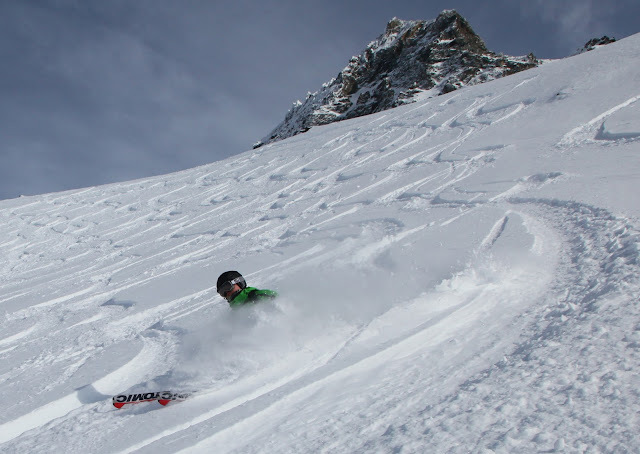 It is hard to predict when you will hit a rock under a seemingly deep powder cover. Aiguille Grive, 2732 m, sits right next to the top of the Transarc lift. An 40-minute hike is needed to climb the 150 meters to get to the top of the main ridge of this mountain. From here you could ski back to the ski area or take one of the backside routes towards the cross country ski center in Les Lanches. The first route that we did here is shown in the picture below. We started from the top lift station (the first marker), climbed to the top of the ridge on Aiguille Grive (second marker) on the obvious route, then skied down to the bowl slightly to the right first and then down. When we reached the bowl, there was a couloir to the right of the beautiful peak (third marker). 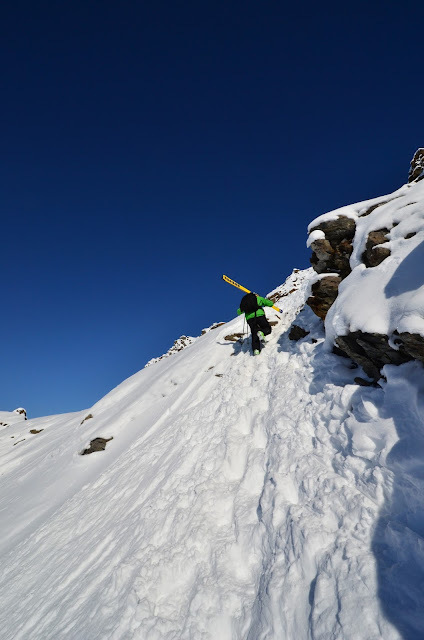 While skiing this couloir it is important to stay on the fall line or slightly to the right; the left side leads to impassable cliffs. At the end of the couloir, we traversed to the right, keeping roughly on the same altitude (1600 meters) until we reached Notre Dame de Vernettes, a lonely chapel built in the 1800s. This is a wonderful spot to have a lunch or break when the weather is good. 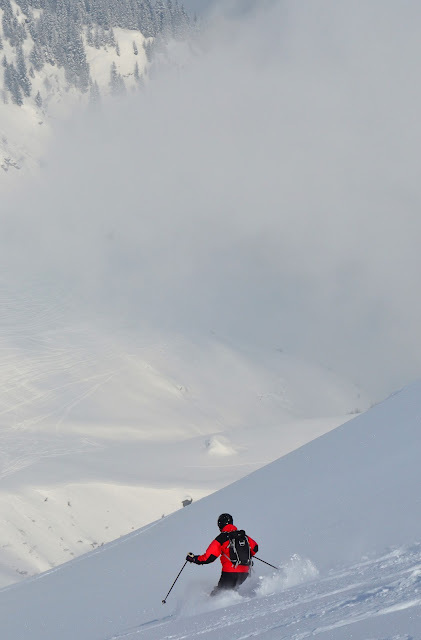 We pressed on, the visibility was not good at this altitude and we had more skiing to do that day. From the chapel, keep to the right and ski upwards for twenty minutes by following the track towards the Combe ski lift (the last marker). Another run that we did here started from the top of the Grand Col chairlift. 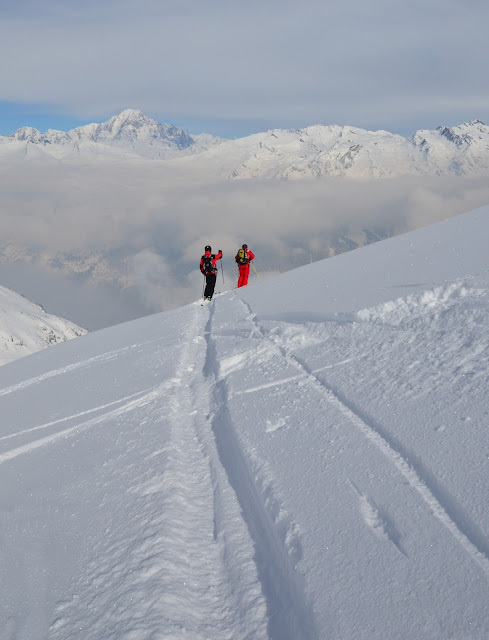 We traversed to the skier's left, skied the steep slope and crossed a bowl, and then climbed up for half an hour to reach a ridge that we followed for a while, and then skied its steep right face (the one facing Aiguille Grive). This run ends at Les Lanches. 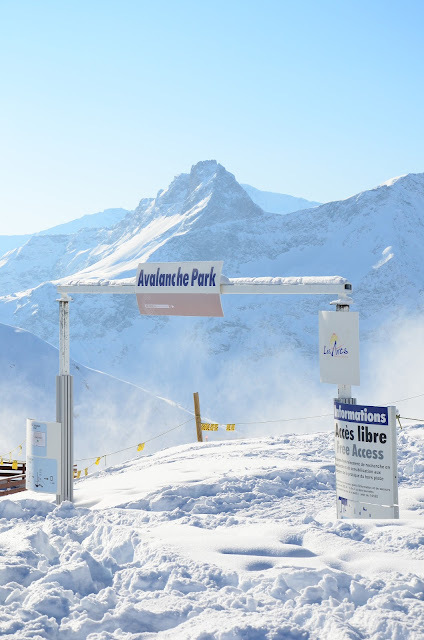 A bus stops at Les Lanches every half an hour to take you back to the ski area. Get off at the bus stop between Peisy and La Villaret; the slow Lonzagne ski lift will transport you back to the rest of the ski areas. Like the other routes, this route is also difficult to navigate and there are dangers if you end up in wrong place. Hire a guide for this trip. On the last day I did not have time for a major tour, so I went up on the Transarc and climbed a part of the Aiguille Grive, then traversed the face under the peak to reach the north ridge. This took about 40 minutes of climbing, and at the end I was on top of a very steep ridge. On the lowest part of the ridge there was a passage towards Vallandry. I did not take this route, but climbed a bit higher to ski back to the Grand Renard slope running towards Les Arcs 1800. At first I had attempted to climb the rocks at the very top of the ridge, but found them too smooth to make progress with my ski boots. I reverted to walking in the snow just below the rocks, which turned out to be easy. Even if at places I felt like sinking into the snow. Climbing a steep ridge. The other side is a cliff. The run from the ridge is not very high, under 100 meters. But no one had skied it before, so the snow was fresh. And the slope is steep. So steep in fact that when I skied it, the uppermost layers fell away in a series of avalanches. Small ones, I could feel them but it was clear that I was not in trouble. (And I was close enough to rescue forces should they be needed in the case of a bigger avalanche.) I was more concerned about hitting rocks under the snow which might send me cartwheeling. Avalanche! Well, a small one. 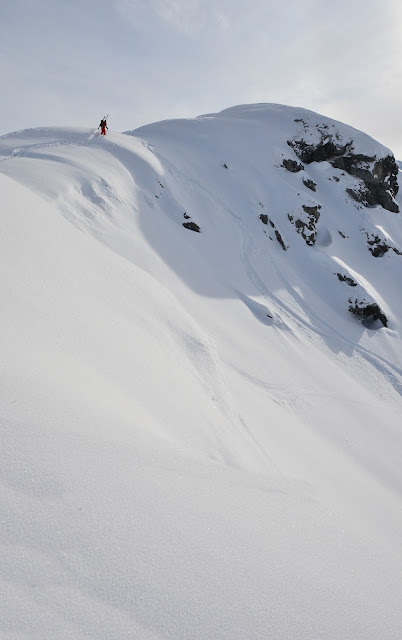 Nevertheless, this small ridge was my best run on this trip. I wish I would have had time to do a couple more climbs. The ridge had space for dozens of attempts on fresh section of snow. In addition, I had chosen the least steep route on my first attempt, and the other ones would have been more interesting. And with some training, I could have skied at a higher speed, making the runs look better. 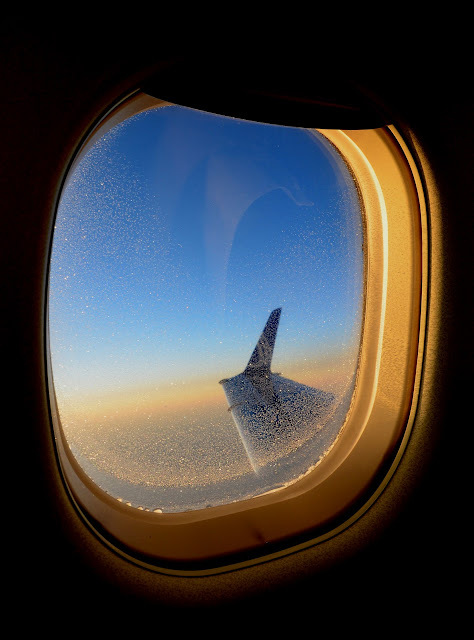 As it was, we had an airplane to catch and had to leave. 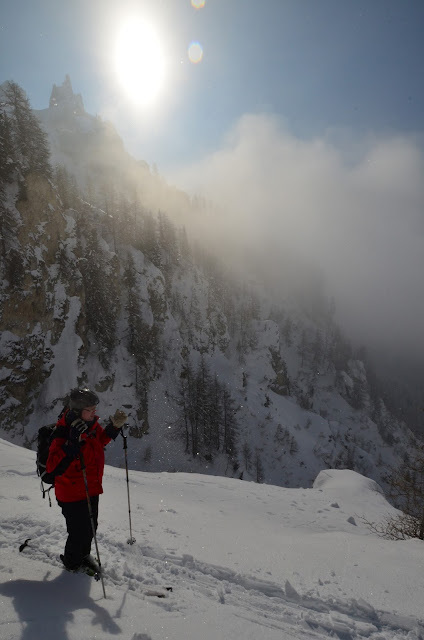 Entering the Les Lanches route from Grand Col. Steep. 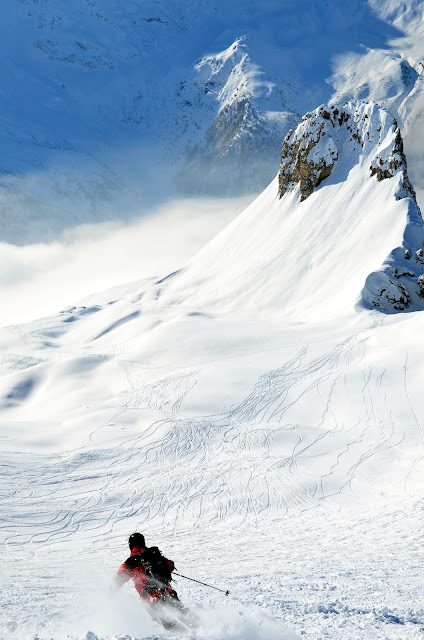 Les Arcs can be reached by car from the Geneva airport, the drive takes about two and half hours. We stayed in the Les Arcs 1800 village. This village is recommended for its liveliest evening life. Like the other villages in this area, it was small and rather artificial, however. A cheaper option would have been to stay at Bourg Saint Maurice, the bigger town down in the valley. Vegetable soup at the Cafe Bulle on the slopes costs 3.50€, half of pizza or a sandwich costs under 6€. These prices are reasonable for a ski area in France. Dinners at Les Arcs 1800 range anywhere from 10€ to 30€, depending on the choice of the restaurant. 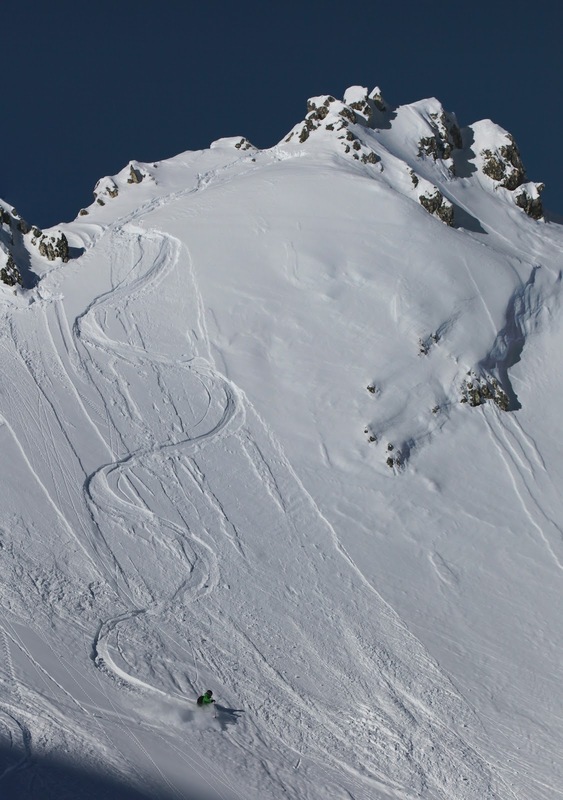 You can find more information about off-piste routes in this area from pistehors and from the book Les Clés de Paradiski by Didier Givois. The book is mostly in French but has English summaries. It is available from Amazon. There is also a small list of routes in the resort worker's guide. Les Arcs is certainly worth visiting for any type of skier. For the skiers that want to stay on piste, there is plenty of variation and the area in general feels more accessible and compact than, say, Les 3 Vallees. Most of the area is for actual skiing, not for long traverses to get one place to another. For the off-piste skier, there are a large number of easily accessible routes, and the number of skiers taking the advantage of these routes is small. So plenty of snow left! Recommended. 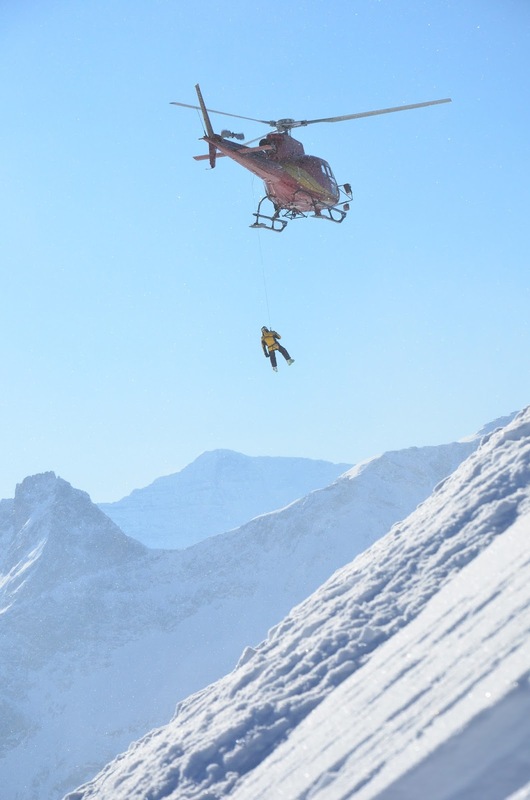 But remember to do this only if you have the equipment, expertise, and guides necessary to do it safely.